Last year, in the process of writing an article for Environmental History titled “From Wild Lives to Wildlife and Back,” I created something like the chart below by hand in order to visualize changes in the usage of the terms “wild life” (two words) and “wildlife” (one word) over the twentieth century. The chart didn’t end up surviving into the published article, but it definitely helped me formulate my argument. Making it was painstaking, though — lots of cutting and pasting search results into an Excel worksheet. The Google Books Ngram Viewer, which went public as I was putting the finishing touches on the EH piece, makes this sort of thing much easier. 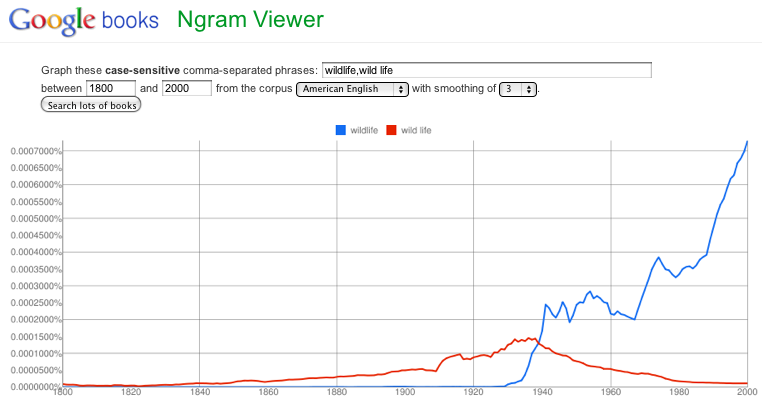 The point of my article was that the word “wildlife” is a relatively recent invention, only really coming into wide use in the 1930s. This is especially evident if one focuses on the single-word form (the blue line), but even the two-word form (the red line) was relatively rare until the 1920s-1930s. I argued that the sudden popularity of “wildlife” in the 1930s wasn’t just a result of the fact that it broadened the range of creatures under consideration beyond huntable “game”, though that’s part of the story. It was also about constructing a category of biological things that could be managed by a new group of experts who had just begun to identify themselves as “wildlife managers”. This move depended on tossing earlier senses of “wild life” as a way of life rather than a kind of living thing into the historical-etymological dustbin. The term “wildlife” thus comes with built-in biopolitical assumptions, I argued, and needs to be used with care. The chart doesn’t prove that point — it can’t. And I wouldn’t call this sort of thing a “quantitative analysis of culture“, as the designers of the Ngrams Viewer do, unless “culture” is defined in such a way as to make it an entirely uninteresting object of study. (See Joanna Radin’s comments over at AmericanScience, which were inspired by the appearance of an Ngram chart at a crucial moment in a workshop on “Endangerment and Its Consequences” held at the MPIWG last month.) Still, I think it can provide starting points for more in-depth research and quantitative support for and challenges to conclusions drawn from carefully reading and contextualizing historical sources.